While I am not surprised TRS receives lots of threats and warnings on regular basis, MP Zagy's choice to use the state media to give TRS an ultimatum of removing an "inaccurate" online article if they do not produce proof to back up their claims, surprised me. The government has never like online publication websites and they have made no secret about it. Only not too long ago, they seem to refuse to accept the existence of these websites and wish they will go away. So, their mode change from "They-must-not-be-named" to attacking them directly, amused me. Unfortunately, the government again did not learn an important lesson from online dissent. Every Singaporean can see the government spending a lot of manpower, time and (now) valuable resources to "regulate" these online media with the tax monies that came from the people. They fail to understand that these alternative sources of Singapore tabloids are operating on a simple demand/supply model and will never be completely eliminated. It's not much different to piracy in this sense. Every Singaporean is technically a criminal by being a consumer. Will the government come out with a new policy one day to criminalise anyone who is caught reading "wrong news"? With their directionless scatters these days, expect the incredulous. MP Zaqy's move peeved me off for some reason. It has nothing to do with TRS or clamping down on online media whatever. I feel really pissed whenever the government demands things from the people. Why did the people of Singapore give them the audacity to do things like that? Whatever that isn't within their own spectrum of truth, they demand for proofs or apologies or retraction. Does this mean truths automatically become lies without evidence? I understand where the government is coming from. It must be frustrating to deal with fabrications, pranks and hoaxes. But that is how the internet has been since day 1 and the government should learn to leave things they way they are and accept the good and bad of the internet. If anything, these disgruntled online chatter serves as a valuable resource to find out how they can dangle the "right carrots" to win back the electoral in a few years' time. Time is running out. Spending time on meaningless battles will only lead them to their demise. Lastly, I would like to invite Singaporeans to think along the lines of Zaqy Mohamed's demands and apply it for more important issues. For example, we have long demand from the HDB to release the figures of building a HDB flat but we were denied for years. Without proof, how can the government claim our HDB flat pricing is not unfairly manipulated. The details of contract awards to HDB contractors should be made public as well. Without evidence, how can the government claim that none of these transactions are fraudulent? These are public money and we have full rights as citizens of Singapore to know how it is spent right down to the last cent. That goes the same for Temasek & GIC investments, CPF, our reserves and so on. If history is anything to learn from, the lack of transparency NEVER fail to lead to corruption and frauds. Many years back, when Dr Chee Soon Juan raised the issue of Singapore's secretive US$5 billion loan pledge to Suharto just before the corrupted Indonesia dictator was toppled in May 1998, the PAP took the opportunity and used the same state media to make Dr Chee look like a lunatic. Till today, many still believe he is one. The most important fact here was nobody asked about that US$5 billion dollars anymore. Our attention had been successfully diverted somewhere else and a political opponent was vanquished with a permanent scar as a 'mad man'. Killing two birds with one stone. 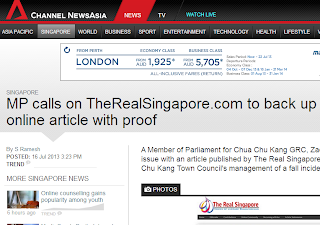 2 decades later, the PAP is still using state media to discredit any voice that questions loud enough. If the PAP believes in telling the truths, producing evidence for every claim and coming clean when a mistake is made, they have a mountain load of work to do to account for Singaporeans who were denied truths for many decades without knowing so. They should be the one taking a step forward to be truthful instead of pointing their fingers at others. 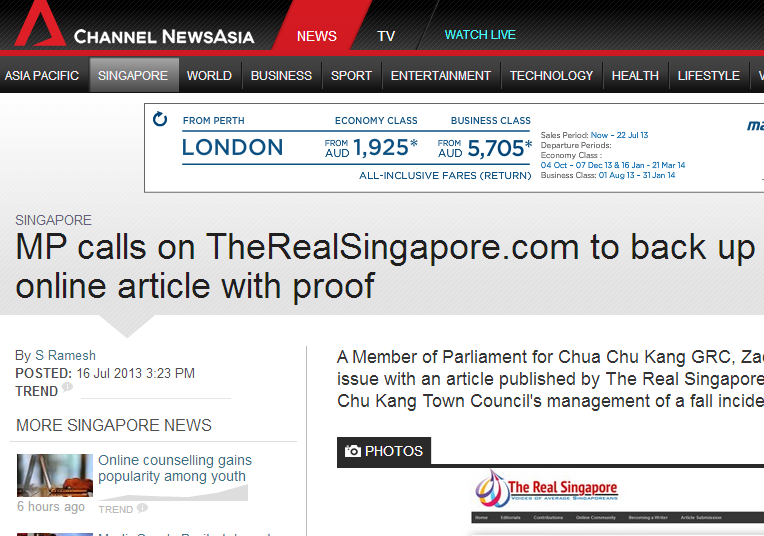 Singaporeans don't want the truth. They can't even be bothered to do a search on Google to find things out for themselves. I am inclined to agree with CK. Generalizing here: The Singaporeans who want the truth are already doing what they can to search/ask/demand for it. However, those are the minority -- 39.9% ? A small segment (e.g. those well-heeled and well-connected folks who are benefiting from status quo), say 20%, would rather the truths remain hidden forever. Then there are the rest, say around 40.1%, who prefer to be spoon-fed state sanctioned "truths" because digging out their own truths would be too much work given their busy city life and/or too scary to deal with. The purpose of the government is to create a society where people will be so busy working from day til night and have little time for politics or scrutinise what's happening in politics. With the fear that was passed down from the preveious generations of not badmouthing the ruling party or talk about it in the open. With the convenience of MSM and with free papers at almost every MRT stations being distributed, it feeds them with the news they intend to. They will eventually read what's printed and will not have time to do any additional research on them nor refuse to read other news site like TRS and others. Just another smoke bomb tactic to pull the attention of the pple of SG away form other more important matters. They will use it until proven ineffective. How Much Money To Bring Along For Migration?